Elizabeth James is a versatile Tutor with a passion for the Arts, Holistic Health and Well-being. Lotus Star : Embrace Life : Your resource for Holistic Health and Well-being. Lotus Star : Art and Design through which I share my creativity : Artwork and Mindful Art Workshops Adelaide. I love all things design and worked in the Web and Graphic Design industry for more than 16 years, now only taking on new clients by referral. My Graphic Design work was originally under the banner of Sandlandesign, with Lotus Star birthed as I emigrated from the UK to Adelaide, South Australia in 2012. Lotus Star encompasses my Holistic Health and Well-being work. I stepped out from behind the computer and now create Art in a variety of styles and mediums, with a a particular interest in Zentangle®, Mandala and Wildlife art. I simply create what I love in whatever medium suits the subject and presentation with my signature use of bold colour and contrast. My Holistic Health and Well-being work initially began as an online community place for like-minded Souls and an outlet through which I could share my journey. I was busy re-training and about to emigrate, and I knew I simply had to start reaching out. Lotus Star : Embrace Life was born and you are welcome to visit the Lotus Star : Embrace Life Facebook page; a lively community with regular posts on all things related to holistic well-being and a free Weekly Oracle Wisdom post. Throughout my spiritual development journey I have continued to broaden my awareness and develop my natural intuitive abilities. My path includes practitioner training in the areas of Crystal Therapy, Colour Therapy, Past Life Regression Therapy, Emotional Freedom Techniques (EFT), Sekhem – Ancient Egyptian Energy Healing, Usui Reiki, Mindful Meditation Teaching, Health and Nutrition, Law of Attraction, Astrology, Tarot, Oracle Card and other intuitive forms of reading, Mandalas, Pendulum Dowsing, Feng Shui, Angels, Aromatherapy, Numerology and more. I hold a level 3 qualification in Human Anatomy, Physiology and Pathology and Emergency First Aid certification. As anyone walking a spiritual path will know, the learning and growth never ends, and nor would I want it to! I am so blessed and grateful for this journey and to all my teachers and spiritual mentors. I share my journey in the hope that it will inspire and inform others. I share my work in the hope that it brings joy and assisted healing to others. There is comfort and support in the circle of which we are all connected. 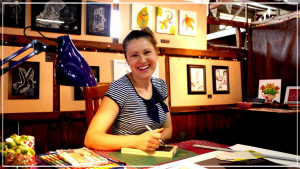 Previously a tutor for the Royal South Australian Society of Arts and currently teaching Zentangle® and Doodle Art workshops in Adelaide and Colour Magic – Adult Colouring In Workshops Adelaide for small groups and one-to-one around the Adelaide region. I also facilitate weekly Social Adult Colouring In groups and Mindful Meditation for the Onkaparinga Council Social Connections Program. Every Tuesday evening you can find me facilitating Mindful Meditation at the Aberfoyle Park Community Centre – I run a well-established, and wonderfully supportive group where newcomers are always welcome, and, more recently, I launched a new group on Wednesdays, during school hours, at the SA Wellness Centre, O’Halloran Hill. Monthly I facilitate two Soul Circle Spiritual Development Groups; two Cuppa, Chat n Craft Sister Support Circles; and a Reiki Share – Heal The Healers Energy Exchange; all O’Halloran Hill. I also run Crystals Workshops with Crystal Pendulum Chakra Balancing in Adelaide. I’m offer private Holistic Therapy Treatments both from my studio at Happy Valley and mobile at your home, and I offer a wide range of Intuitive, Tarot, Mandala, Crystal, and Numerology Readings in person, via Skype or online delivered to your inbox. I’m a proud contributing author to ‘Believe! The Gift of Inspiration for Female Entrepreneurs’ – available in paperback and kindle via Amazon. Lotus Star is my life’s work : You are very welcome here.